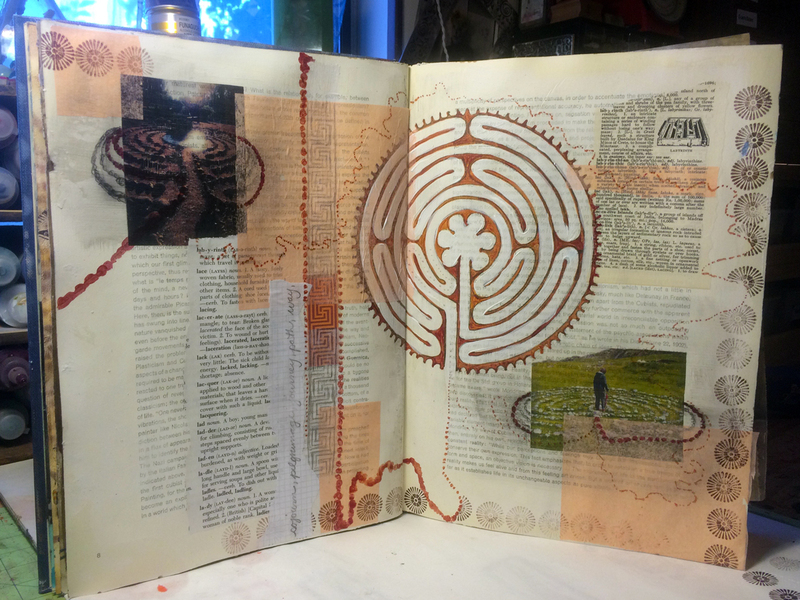 Pictured above is a page in my mixed media mindfulness journal showing two labyrinths I’ve walked, the one on the left at The Bishop’s Ranch and the other on the island of Iona in Scotland. Yesterday it rained. It rained eight tenths of an inch. Such a gift in this parched, scorched part of the world. This morning, as the clouds pushed east and the sun rose amid the mist of yesterday’s rain, I walked the labyrinth. I have been walking the labyrinth several times a week as part of my new commitment to meditate each day. I find walking the labyrinth helps me clear my monkey mind and be present to the big mind, the universe, God. I have taken to walking the pressed gravel path barefoot. Carefully placing each footfall – feeling the earth fully helps me be present. Today as I removed my clogs the rain soaked trees dripping in delight, the exuberant birds greeting the sun, the rain and their flock fellows, the ground made a new sound a new crunch each step spoke of the soil’s joy at being moist again. The labyrinth here at The Bishop’s Ranch, like many, has a path that at the beginning leads you very close to the center then it meanders back and forth and around taking the sojourner far from the middle. The labyrinth doesn’t have any dead ends or secret passages way if one stays on the path no matter how long the passage you will come to the center. 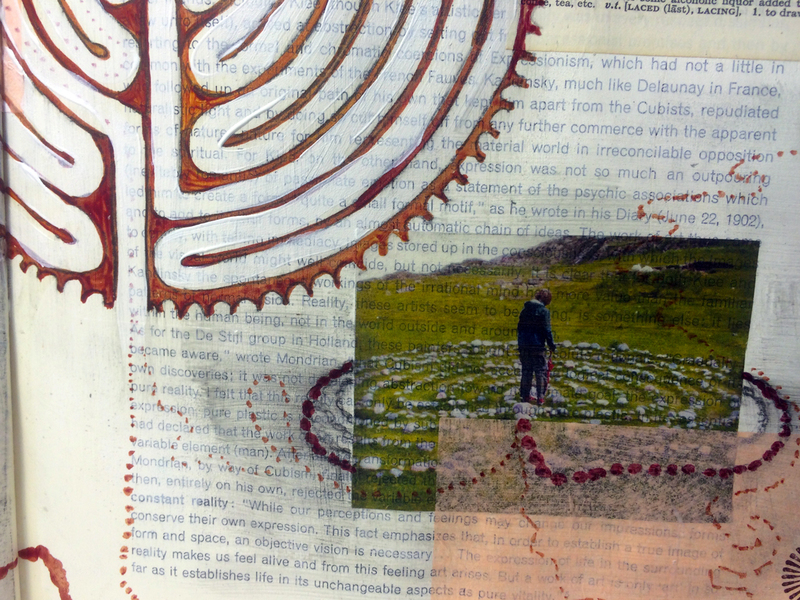 When walking the labyrinth I remind myself that it is a metaphor for my life journey. I know the center I seek is there I have glimpsed it on my long life excursion but I must stay on the path even when it feels far from the comfort of the center circle. When I arrive in the middle I take a moment to count my blessing and say my prayers. And then because life beckons I exit. I always try to walk out with the same deliberate careful step I took as I had when I entered but try as I might I find the way out faster than the way in. But as in the beginning of the journey the labyrinth brings me close to the center one last time before birthing me into the wide world again – a reminder to slow down, to feel the earth on my bare feet to listen to the birds song and feel the fresh rain before it slips away. Detail of journal page. I used Graphix computer printable adhesive backed transparent sheets to print my photos on. I love this product and will be experimenting with it more. 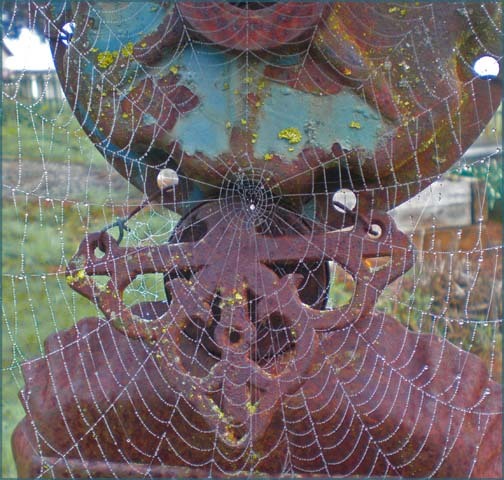 Early in the week the misty morning revealed this beautiful spiders web that was drawn like a lace curtain across an old rusty garden sculpture in my yard. The dewdrops unveil the intricacy of the spider’s lair. The torn and mended spots are exposed as well, illuminating the spider’s labors, revealing her efforts to keep all the strands connected, a structure for her livelihood. When one piece is torn or worn she must address it or risk the whole entanglement coming undone. And so it is with life sometime we must address the torn strand laying at our feet and hope that days of visioning and creating aren’t too far off. This week I had every intention of painting a February painting to include in my ongoing calendar series but life got in the way. An extra day off for my son from school, graphic art deadlines that just wouldn’t quite get gone, emails that needed action on and on and on, you know how it goes. In my house we say it was a “If you give a mouse a cookie” day (referring to the children’s book by written by Laura Joffe Numeroff and illustrated by Felicia Bond). This is a favorite with little kids including my son back in the day. It starts with “If you give a mouse a cookie, he’s going to want a glass of milk, if you give him a glass of milk he’ll probably want a straw…. and so on”. So this week was full of “If you give a mouse a cookie days” in fact it was a whole cookie week. Like pulling a loose thread on a sweater that just kept unraveling, it seemed I couldn’t bring anything to resolution. And so it goes. I’ll finish my February painting next week and share it with you Friday, which by the way will be March already! Sometimes you just have to follow the cookie crumbs life presents you with, in my case I can only hope there are chocolate chips involved. Speaking of webs if you are a visual person you might like Pinterest. It is like a cork board in your computer to pin up all kinds of visuals. You create you own pin board categories and when you find a piece of art, or photo, or recipe you like you pin it on your board, you can follow other peoples pins that connect like strands of a spiders web or not but it’s pretty cool check it out here is a link to my boards http://pinterest.com/artlisa/. It’s fun. There is something in the wind here; something is out of balance that has put everyone off kilter. Here in Northern California the weather is all wrong. Summer is refusing to show herself, and everyone is peevish. It is the last week of school and at the moment about 55 degrees and threatening rain. For my subscribers from hither and yon, this is not normal. We are usually enjoying a wonderful heat that beckons one to linger on the patio and putter around the yard in the evening. Usually we are slipping on skirts and sandals with our boots long pushed to the back of the closet. But not this year, I had packed away my boots back in April but I had to admit defeat and dragged them out again this week comfort beating out fashion. I have a friend who is resolutely ignoring the temperature and came to our book group gathering this week in post memorial day white pants, sandals, and a sleeveless top, I admired her moxie and resolve to thumb her nose at Mother Nature’s whims but I didn’t envy her goose bumps as I wrapped my big sweater around me and curled my booted feet up on the couch, hot toddy in hand. W hat I’m getting at is how uncomfortable we all become when things are not what we expect. We have a vision of what something is and when it is different we don’t know what to do, how to respond. I am about to make a change in how I approach this blog. I have been struggling with the change because I set up this challenge for myself with great seriousness. Over the past 9 months I have faithfully posted twice a week for 36 weeks. I have posted 72 times. It has been both exhilarating and humbling and I have equally enjoyed and dreaded this self-imposed homework. I am so grateful to have you 60 email subscribers and 100 or so Facebook lookers every week, just knowing you all are out there has kept me faithful to the challenge. Thank you. I have decided that my pace is too rigorous, that more time to ponder and create would enhance the journey (and give me more time to do the work I get paid for). To help support the blog so I can continue to follow this path least taken I have put the blog art up for sale on my website. Follow this link to see all the applicable pieces of art now for sale http://lisathorpe.com/mandala.html. I will be taking a break from the challenge for the month of June. My nearly 15-year-old son and I have been taking American Sign Language this past year at the local community college and will be taking up an ASL 3 intensive course at Sacramento State beginning today. When I return I will post once a week on Friday. The first Friday will be the challenge photo and the next Friday will be the response. 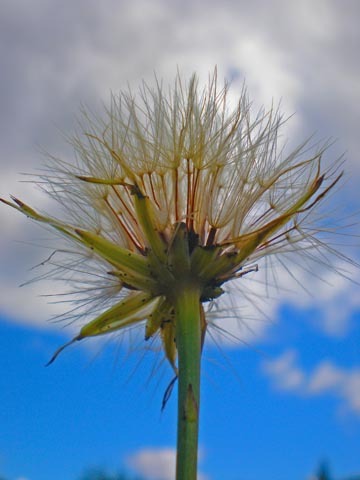 Upon my return I will post a piece relating to this dandelion photo. 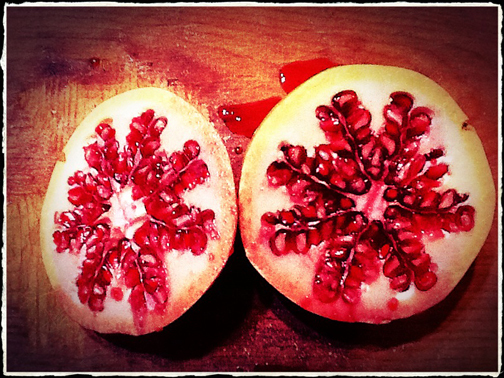 I was stimulated to use this image by another challenge blog that a friend of mine is a part of. The Twelve by Twelve International Art Quilt Challenge is a fantastic group of 12 women creating wonderful art. Their first challenge was a dandelion and is now part of a lovely book. Follow this link to see their dandelion responses and then check out the rest of their blog http://twelveby12.org/dandelion/index.html. You’ll hear from me next on Friday, July 1st, until then check out my website with Mandala Challenge Art from the past 9 months. Here is a little homework for you- I’d love to hear from you about what moved you most these past months specific writings or art or just your general vibe. Here we are again betwixt and between, neither here nor there, I’m talking about standing in the thin place between spring and summer. The capricious disposition of spring still prevails sending tufts of willow and dogwood floating in the afternoon sun like fairy moats dancing to the winds whimsy. 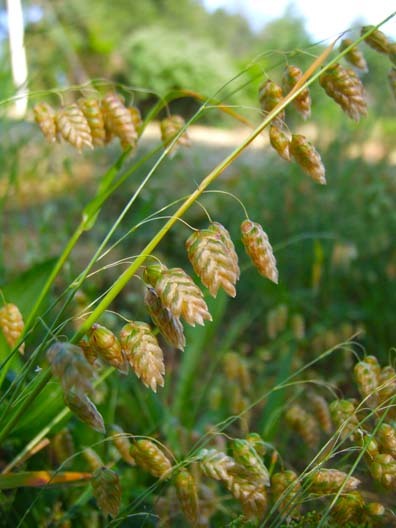 But the unerring tilt towards summer can be read in the green grasses now dipping their tips in the golden paint of a California summer. Just this weekend I noticed the change, despite the heavy rains of last week, the grasses speak the truth… spring cannot last forever, summer will come. It is in these thin places that we feel the change most acutely, witness it most accurately. When we are in full burst, full bloom, full bounty we are too laden with the moment to think it can ever change, but change will come, as it must. So wherever you are, look for the thin places in your world, be witness to this moment of change and transformation and pause to preserve this green memory before it floats away like the willows on the wind, and turns gold in the inescapable sprint to summer.